Aconcagua, the highest peak in the world outside of Asia, is a goal for climbers of all ability levels. While not technically demanding, The Polish Traverse Variation on Aconcagua requires a high level of commitment. It sees far fewer climbers than the Normal Route and the views are considered superior. This makes a guided Aconcagua climb via the Polish traverse a great mountain climbing expedition for motivated climbers and trekkers who want to climb Aconcagua without wanting a technical climb. Our normal itinerary is to go up the Polish Traverse route and down the Normal route on the other side of the mountain giving you new views the entire expedition. Our Aconcagua climbing expeditions are small groups with no more than six climbers which works out much better than larger groups while on the mountain. There are many companies that run large group Aconcagua climbs, but we have decided to specialize in small groups led by highly experienced and certified American mountain guides. We provide you the best of care with a low guest-to-guide ratio of 1:3, personal attention, and top local logistical support. On our scheduled expeditions, we have a minimum of two mountain guides per group. We take high altitude climbing seriously and treat our Aconcagua climb with much respect and care. Our Aconcagua expeditions start as you arrive at the airport in Mendoza, Argentina with 4-star lodging, private transportation and full support to the summit and return. Mule support to Aconcagua base camp and base camp cooks are provided for your comfort and to ease the acclimating process. 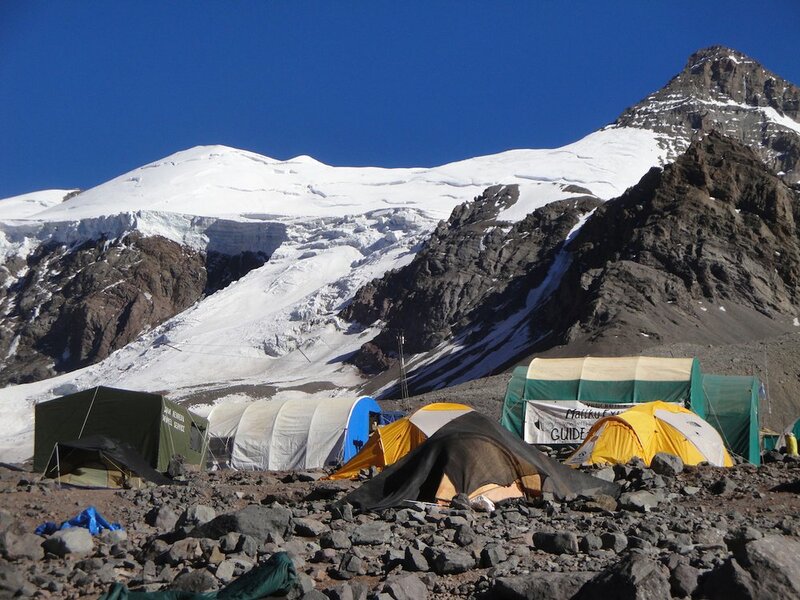 Optional porter services are also available above base camps to the high camps on Aconcagua to enable you to carry lighter loads. We also offer custom Aconcagua climbs, something many American guide companies do not provide. 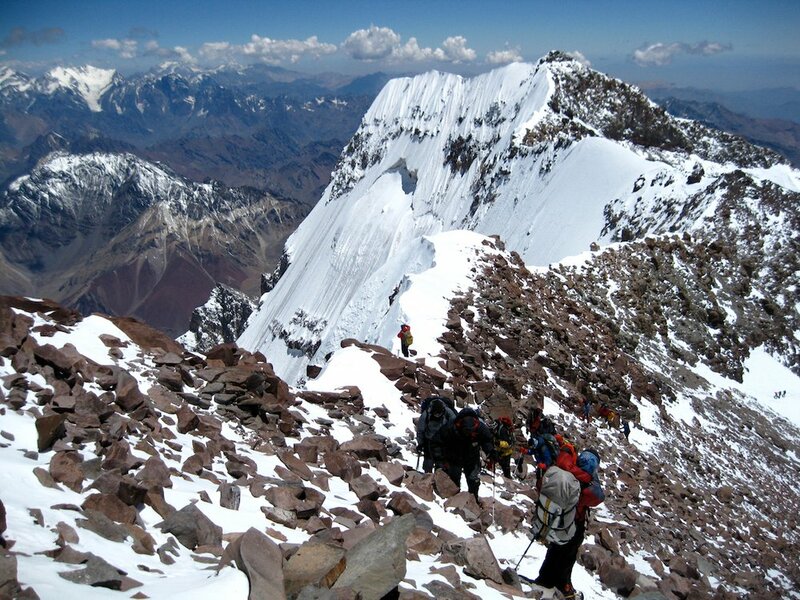 A custom Aconcagua climb allows for you to go at your own pace solo or with people you know. It is a much better way to go if you have a group together already. We guide both private one-on-one Aconcagua climbs and custom group Aconcagua expeditions. Contact us for details. When choosing a guide service for Aconcagua or any high altitude expedition, consider not only the experience of the company, but also who is more likely to give you the most enjoyable experience. Many good companies operate on Aconcagua, but we feel IAG's personable & experienced American guides stand out for their dedication to giving you the best experience possible. A great mountain climbing goal for those looking to bag one of the seven summits without any technical climbing demands. Let the friendly professionals at IAG and our top-notch logistics show you the way! No previous climbing experience is required for our Aconcagua expeditions. Backpacking experience and previous experience with altitude up to at least 14,000 is required. You should be in very good to excellent physical shape. Guiding at a one to three ratio. Lodging at double occupancy in a 4-star hotel is provided in Mendoza. While on the mountain we provide 4-season expedition tents. We provide all food on the mountain including base camp meals prepared by professional cooks. Flight from your country of origin and arrival in Mendoza, Argentina. We will arrange for a private pickup at the airport. There will be time to explore this wonderful city known for it's steak dinners and fantastic red wine. We will have a group dinner to discuss trip logistics. A half-days drive to Penitentes, close to our trailhead, where we will stay the evening in a hotel. We begin our trek with mule support to Plaza Argentina (13,780 feet), our basecamp. 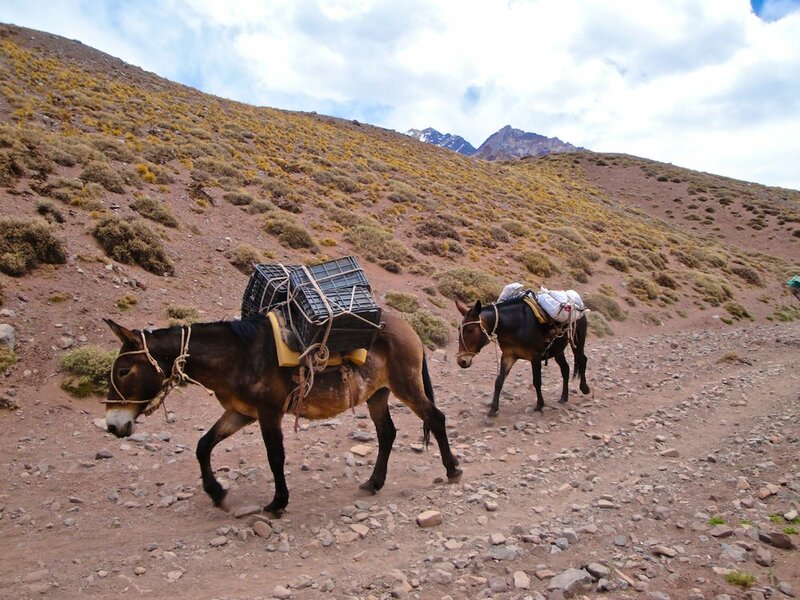 Mules will carry all of our equipment so as to allow us to enjoy the beautiful three-day trek with lighter packs. Acclimating/rest day in Plaza Argentina and preparing for our ascent. Carry some loads to Camp I, but returning to basecamp for the night so as to practise the philosophy of sleep low, climb high. Throughout the expedition we take our acclimating very seriously and go slow so as to remain safe and ensure the best chances for summiting. Rest day and acclimating in basecamp. Move to Camp I (at approximately 15,500 feet) and spend the night. Move to Camp III, our high camp. Exact elevation and location of high camp will be determined according to conditions and group strength, but will be somewhere above 19,000 feet. Rest day at high camp to prepare for our summit attempt. These extra days are built into the itinerary to allow for weather and/or flexibility for group strength, etc. We feel having a somewhat flexible itinerary is very important to our success. One of these days will be the summit day. From high camp, we eventually join the normal route and climb through the Canaleta, a scree or snow gully that tops out at the Cresta del Guanaco, a ridge leading to the South Summit. We continue on to the higher north summit (22,841 feet) and the highest point in the Western and Southern Hemispheres. We descend back to basecamp for the night. Trek back out to the trailhead near the Puenta del Inca and overnight at a hotel in Penitentes. Travel back to Mendoza where we will celebrate our time on Aconcagua with a good dinner and some rest. Flights back home, or begin an optional stay in Mendoza.